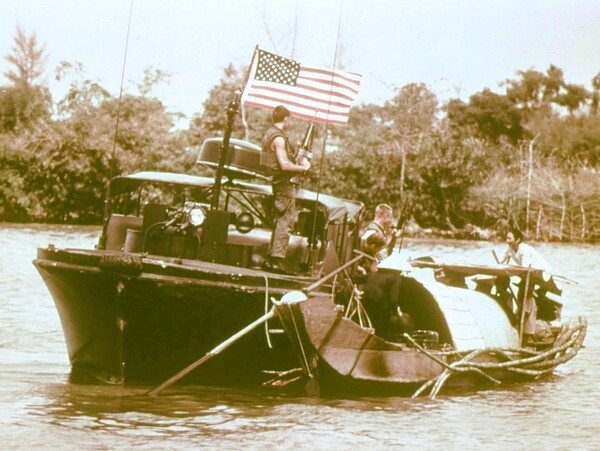 The U.S. Navy’s River Patrol Force (Task Force 116) was established in December 1965 to carry out operation Game Warden, the surveillance and interdiction of Viet Cong activity in the Mekong Delta. To navigate the Delta’s inland waterways the Navy used fiberglass-hulled PBRs (Patrol Boat River), which were driven by two Jacuzzi water jets rather than by propeller. Air support for the PBRs was provided by Helicopter Attack (Light) Squadron Three (the "Seawolves"). In November 1968 the River Patrol Force, in combination with the Coastal Surveillance and Riverine Assault Forces, began operation Sealords, which successfully cut Communist infiltration routes from Cambodia and pacified large areas of the Delta. The new operation received additional air support from the OV-10 Bronco aircraft of Light Attack Squadron Four (the "Black Ponies"). Simultaneous to Sealords, the PBRs were gradually transferred to the Vietnamese Navy until Task Force 116 was deactivated in December 1970.